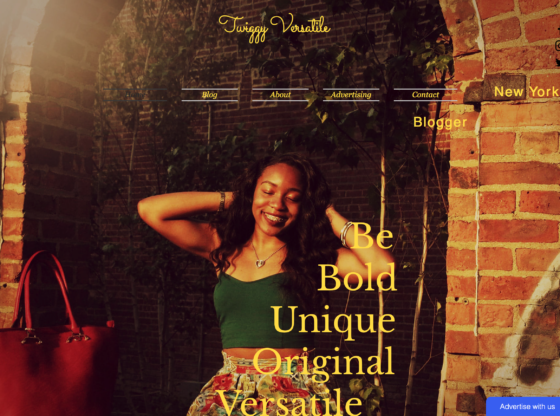 St. Francis College junior Zoe Felix launched her fashion, beauty, and lifestyle blog Twiggy Versatile earlier this month. Zoe said: “I wish I would’ve started this the minute I had the thought. I had so many ideas and at first I wanted to do a vlog, but I figured let me start with the blog first. In investing in herself and her idea, Zoe has had a successful launch of Twiggy Versatile. Her blog features lifestyle and fashion tips and tricks based on new trends and ideas both Zoe and other contributors have. Zoe believes that her blog is different because of her personable character. She claims that within the fashion and lifestyle blogging industry there is a disconnect between the blogger and their following. Zoe does not want this to be a problem for her blog. She hopes to eliminate this apparent gap by getting to know her following and connecting to them on many different platforms. Twiggy Versatile was made to honor her biggest fashion inspiration – her mom. Zoe describes her personal style as “versatile”. She even encourages her followers to change up their personal styles if they feel as if they are in a rut. She does this by inspiring her followers to get “inspiration from everyday people.” Just seeing what others are wearing can open entire new worlds within the fashion, beauty, and lifestyle industry. Zoe hopes to inspire her followers through a segment she created on Twiggy Versatile highlighting an individual for a week with an interview and spread of pictures. These interview touch on fashion and lifestyle topics such as inquiries into their personal styles, opinions on fast fashion in the industry, and advice interviewees can give to her followers. Zoe has been able to balance school work, work, and maintaining her blog. Zoe hopes her fashion, beauty, and lifestyle blog can offer others who are passionate about the industry, to be inspired and to challenge their limitations. She wants Twiggy Versatile to be a safe place where she can use her platform to reach all kinds of people that she shares her ideas with.